This 5 inch grey mouse is cute in her dress done in a delicate red and white filigree printed fabric. She also has lace accenting the collar. She is busy working with her spool of red thread and needle. The top of the spool hasthe words Sew In Love on it. Her tail is done in a heart shape as well. 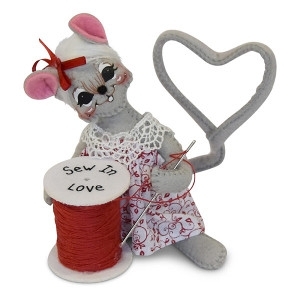 Cute item to decorate with and is a great gift for those who like to sew.